How Often & How Long Should the Elderly Exercise? A regular exercise program is the best available prescription for independent, active and healthy aging according to the AARP, the National Institute on Aging and the Centers for Disease Control and Prevention. A large health study reported in 2011 suggests that all adults -- including seniors -- can benefit from as little as 15 minutes per day of moderately heart-pumping exercise. About 30 minutes is the official recommendation, in addition to at least two sessions per week of muscle-strengthening activity or exercise. Try to fit four types of exercise into any senior exercise regimen. As the National Institutes of Health puts it, exercise is the fountain of youth. Exercising regularly helps aging adults remain independent and stay active, strengthen muscles, improve balance and prevent serious falls. Research suggests that an exercise program helps prevent or delay heart disease, diabetes, breast and colon cancer, and osteoporosis. Regular exercise helps regulate weight, improve mood and reduce depression. Exercise may not prevent dementia, but there is increasing evidence that it can postpone its onset -- buying seniors precious time with loved ones. Exercise that gets the heart pumping and the blood circulating, thereby building endurance or “staying power,” is the core focus of any exercise program. Walking, hiking dancing, bike riding and swimming offer seniors a good moderate workout; so, work in the garden, rake leaves and push a lawn mower. A balanced exercise program also needs to build muscle by working all major muscle groups -- doing physical labor, lifting weights and practicing yoga or other body-weight resistance work -- to help counteract age-related muscle loss. 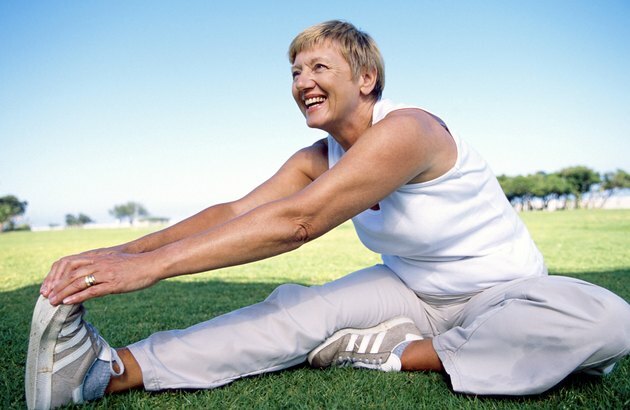 In addition, stretching exercises, to maintain flexibility, and balance exercises help seniors stay active and injury-free. Regularity is important to the success of any exercise program. Getting some aerobic activity every day, or nearly every day, is ideal because daily exercise quickly increases and helps maintain endurance. But if daily walks or other workouts aren’t possible, those 150 minutes per week of moderate heart-pumping exercise can be divided up any way that works. Repetition and regularity are also needed to build muscle. At least twice a week, seniors need to lift weights, work with resistance bands, do yoga or otherwise focus on strengthening muscles. For walking, bike riding or other moderate exercise -- rigorous enough so that it’s hard but not impossible to talk -- seniors should slowly build up to 30-minute workouts. And if 30 minutes all at once is impossible, two 15-minute sessions or three 10-minute workouts are fine. For most seniors, each week’s muscle-strengthening sessions should also be about 30 minutes each. But even 15 minutes of moderately intense exercise may help prevent cardiovascular disease, according to a 2011 report in “The Lancet.” A large health study in Taiwan followed about 416,000 people for an average of eight years and discovered that people who exercised just 15 minutes a day reduced their mortality from all causes by 14 percent and increased their life expectancy by three years. How Much Should I Exercise With a Sedentary Job?